While solar water pump is pretty straight forward to those of us within the industry, it may not be so to someone that has just come across it. To help you newcomers out we have compiled a list of the most frequently asked questions (FAQ) regarding solar water pump systems that we hear at the Oasis. How much will a solar pumping system cost to water 100 head of cattle? How many different types of solar pumps are there? Which pump should I use? What is total dynamic head (TDH)? Can I “pull” water out of a well with a surface pump? Can I install a solar pumping system in my 2″ cased well? Should I use a tracker or fixed mount for my solar modules? Should I use batteries in my pumping system or go solar direct? Can I use a solar pump to pressurize a tank for domestic use? Can I use a wind turbine to pump water? What size wire and discharge pipe should I use? Can I use solar or wind power to keep my stock tank from freezing? Will a solar pump s pumping once the tank is full? That depends on how many people or head of livestock you want to provide water for. The chart below lists some averages that you can use to estimate your daily water demand. That depends on your location, water source and time of year usage. One hundred cattle can drink 2,000+ gallons of water per day which can be very cost effective to provide from a shallow source of water (£100′) in the summer months. Please fill out our water pumping questionnaire and send it to us and we can put together an itemized system quote for you. How many different types of solar pumps are there? There are really only two basic types of solar pumps; positive displacement and centrifugal and these can both be subdivided into surface mount and submersible categories. Your water source will dictate whether you need to use a surface mount or submersible pump while your daily volume requirement and total dynamic head (TDH) will determine if you need a positive displacement pump or centrifugal pump. In general, positive displacement pumps (diaphragm, piston, helical rotor, etc.) are best used where the TDH is high and the daily volume requirement is low. Positive displacement pumps usually require less power to operate than a centrifugal pump and they will produce some water even in cloudy conditions where a centrifugal pump might not. Centrifugal pumps are good in situations where the TDH is low and the daily volume requirement is high. One of the disadvantages of a centrifugal pump is that it has to operate at a high enough rpm to push the water all the way out of the well. If it is cloudy and the solar array is not producing enough power, the pump/motor may be turning but not fast enough to do this. Using a tracker is highly recommended with a centrifugal pump since it increases the solar array’s power output over a longer period of time which increases your daily volume of water delivered. We carry pumps from the following manufacturers: Lorentz, Dankoff, Grundfos, Shurflo, Sunmotor and Sun Pumps. Click on each name for information about the different models that they have to offer. That depends on many factors all of which are addressed in our “Water Pumping Questionnaire”. Please fill it out as best you can and fax/e-mail it to us and we will gladly recommend which pumping system will best suit your needs. Head is measured in feet/meters or psi and it is a term for the distance that a pump has to push the water from your source to your tank. It may seem odd to be able to list head in terms of pressure or distance, but keep in mind that a column of water 2.31′ tall produces 1 psi at the bottom of that column so there is a correlation between distance and pressure. The greater the vertical distance is in between the water source and the tank, the harder the pump has to work to get the water there. Static head is the simple measurement from the surface of the water (when the pump is not running) to the tank. Dynamic head takes into account the amount the water level in the well drops when the pump is running plus the friction loss in the discharge pipe run. Total Dynamic Head is the sum of the static head and dynamic head. Yes, but you are limited as to how far you can pull water up. The theoretical maximum is 33′ if you were able to pull a perfect vacuum at sea level. However, few pumping systems are setup at sea level and no pump on the market is able to develop a perfect vacuum on its inlet side. A good rule-of-thumb to go by is don’t assume that you can reliably pull water out a well where the static water level is lower than 10′. The smallest submersible solar pump that we have is the 3″ diameter Grundfos SQFlex so a 2″ casing presents a bit of a challenge. If the water is within 10′ of the surface, we may be able to pull the water out with a surface pump. Otherwise you would have to consider using a jack pump which looks and works just like an oil well you see in various parts of the country. These systems are fairly expensive and complex with their sucker rods, cylinders stroke length so give us a call and we can help you design this type of system. The answer to this question depends on your application (domestic use or stock watering), the daily volume of water that you need and what time of year you plan to use the pumping system. For most livestock water pumping applications where the highest daily volume of water is usually needed during the summer, a tracker is highly recommended since it can increase your daily water production by as much as 40% as compared to the same array on a fixed mount. In the winter time, a tracker only increases your daily water production by 5-10%. If your daily water volume requirement is low or you are setting a solar pumping system up for winter time use, then a fixed mount structure is probably the best choice. There are several manufacturers of tracking mount structures, but they can all be divided into two categories: active and passive. Active trackers use sensors, actuators and motors to follow the sun from east-to-west while passive trackers use the heat of the sun on two sealed freon containers (one on each side of the tracker connected with a tube) to do the same thing. Passive trackers are simple and reliable, but they aren’t as accurate in aiming at the sun as active trackers and they can be blown off course in high winds. On the other hand, active trackers are more trouble prone and more expensive than their passive counterparts. Give us a call if you want to look into trackers in more detail. Using batteries in a solar pumping system lowers the efficiency as compared to going solar direct since it usually lowers the operating voltage of the pump which lowers the operating speed and flow rate of the pump. Adding batteries to a pumping system costs more money for the batteries themselves plus a required charge controller, battery enclosure and additional disconnects and wiring. Batteries require care and maintenance that isn’t always possible in a remote location. Batteries performance level and expected lifetime are closely connected with the temperatures that they are subjected to. If batteries are undercharged and subjected to freezing temperatures they could be damaged. If batteries are overcharged and subjected to high temperatures their lifetime will be shortened dramatically. Care must be taken to shield batteries in a remote location from temperature extremes. 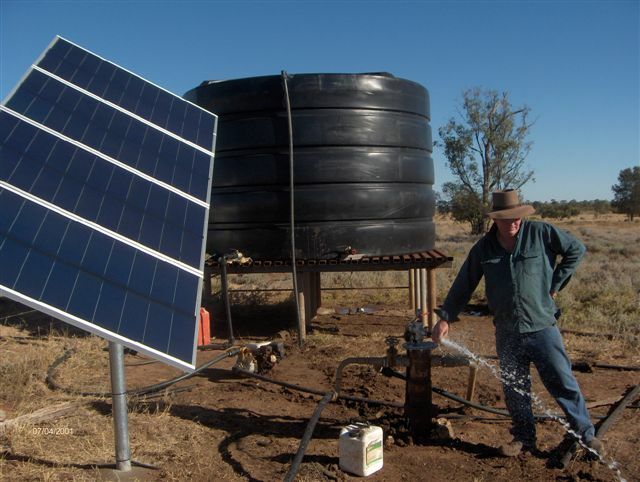 You’re better off all the way around if you simply go with a solar pumping system that is designed to give you all the water you need during the daylight hours without having to resort to using batteries. Store water in a tank instead of energy in a battery! For a livestock watering system or gravity fed domestic application, we recommend that you use a storage tank that can hold a minimum of 3 days worth of water. Maybe. Keep in mind that 1 psi = 2.31 feet of head so pressurizing a tank up to 50 psi adds about 115′ of head that the pump must push against so be sure that your pump can handle it. I would not recommend using a diaphragm pump for this application because you run the risk of rupturing the diaphragm if your pressure switch malfunctions. Another reason not to use a solar direct pump to pressurize a tank is that your tank might get low in the early morning or late evening when there isn’t enough sunlight for the pump to operate. Pressurizing a tank is best left to a separate booster pump or an AC centrifugal submersible pump running off of your inverter/battery bank, generator or utility power. Better yet, pump to an elevated tank and gravity feed down to your home or wherever you need the water. Yes, but how cost effective this will be depends on your location (i.e. average wind speed), the daily volume of water you need and what season(s) of the year you need the water. If you have a very windy site and you are looking to provide water for a winter pasture, then a wind powered pumping system makes sense. In general the available wind power is highest in the winter and a solar array’s power output is highest in summer. The two power sources compliment each other very well seasonally so for the best year round pumping system it could very cost effective to setup a hybrid solar/wind pumping system using one of the new Grundfos SQFlex pumps with a Whisper H80 wind turbine. Keep in mind that wind turbines have moving parts which are subject to wear and tear and require maintenance so a wind powered pumping system may not be as reliable as solar. The proper size wire to use in between your solar array and/or wind turbine and the pump depends on the voltage and amperage of your power source and the distance you need to run the wire. The size of the pump’s discharge pipe depends on what type of pipe you plan to use (steel or PVC), the distance from pump to tank and the gpm flowrate that the pump will produce. The smaller the pipe is the higher the friction loss which makes your pump work harder to produce less water. We have several charts available to determine the best wire and pipe sizes to use for your pumping application so just give us a call and we’ll design it for you. That depends on how cold it gets at your site, if your tank is insulated/bermed and how you plan to keep your tank from freezing. Heating elements consume a lot of power to keep water from freezing which would require a large and expensive solar array to operate. There are bubbler system on the market that simply circulate the warmer water from the bottom to the of the tank and those are much more efficient than a heating element. In very cold climates it is best to install a cover on your tank that leaves only a small portion of the water exposed and then berm your tank all the way around and on of the cover. There are other more expensive and complicated methods of taping into the warm earth temperatures below the tank as well as insulating the tank and only providing water to the livestock when they come to the tank to drink so give us a call and we can direct you to companies that provide those products . Yes if you design it that way. Most solar pumping systems utilize a controller that among other things will accept the input from a float switch in your tank which tells the pump when to start and s. Some of the other functions of pump controllers are low water cut-off, lightning protection and load matching through the use of maximum power point tracking from the solar array. perfect method? I have a venture that I’m just now working on, and I’ve been at the look out for such info. Hi, its nice article about media print, we all be aware of media is a impressive source of data. understand this side of your story. I was surprised you aren’t more popular because you certainly possess the gift. I wonder how a lot attempt you place to create one of these excellent informative web site. I got this web page from my pal who told me concerning this website and at the moment this time I am visiting this web page and reading very informative posts at this place. blog and will often come back later on. I want to encourage you continue your great job, have a nice afternoon! I know this website offers quality dependent content and additional information, is there any other site which presents such data in quality? Hi to all, it’s genuinely a fastidious for me to pay a visit this site, it includes useful Information. What i don’t realize is in truth how you are not actually a lot more neatly-appreciated than you might be right now. it, you will be a great author.I will be sure to bookmark your blog and definitely will come back in the future. I visited multiple web pages however the audio quality for audio songs existing at this web site is really fabulous. colleagues about this piece of writing, while I am also keen of getting experience.